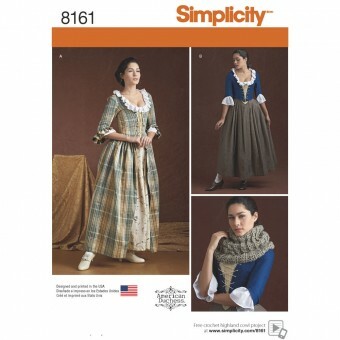 Simplicity 8161 is an easy beginner's cosplay pattern for 18th century attire. This pattern is a costume pattern that may be made as a gown or a bodice with a separate stomacher and petticoat. The pattern is based on original 18th century pattern shapes and can be added to an altered to create a variety of looks. Simplicity 8161 should be worn with the correct underpinnings, such as the stays, shift, and bum pad found in Simplicity 8162. For more ideas on how to "hack" this pattern, check out our free pattern supplement. Gown - silk taffeta, damask, brocade, printed cotton, wools, linen. Bodice - wools, brocade, printed cotton, linen, velvet. Stomacher - Fabric matching the bodice or gown, embroidered fabrics. 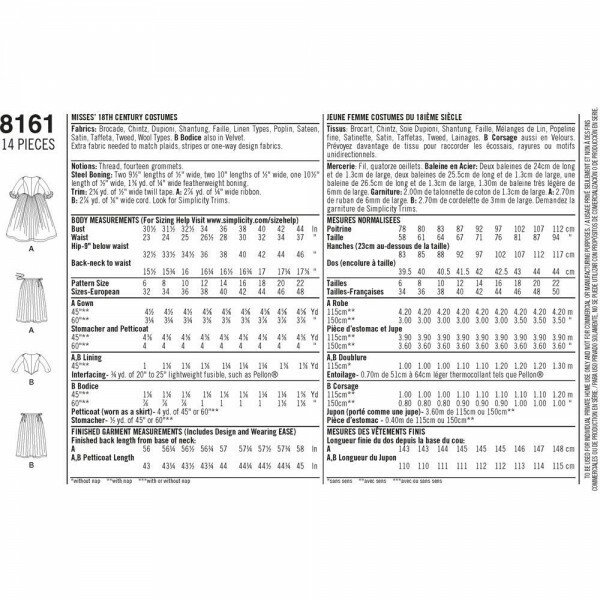 Petticoat - Fabric matching the bodice or gown, silk taffeta, damask, brocade, printed cotton, wools, linen.